Casting aside any criticism politicizing tragedy, Orlando state Sen. Linda Stewart, Orlando state Rep. Carlos Guillermo Smith and a statewide coalition demanded talks Wednesday on gun law reforms, particularly on their bills banning sales of semi-automatic weapon and high-capacity magazines in Florida. Democrats Stewart and Smith filed such bills last session, in the memory of the Pulse massacre in Orlando, but they were never heard by committees. They filed again for this session. Stewart, with Senate Bill 176, filed in August and Smith, with House Bill 291, which he filed Tuesday — just two days after the Las Vegas massacre. “And now I’m having the same feedback: ‘Oh, it’s just too early to talk about this,'” said Stewart, whose district represents the Pulse nightclub area. “It’s not too early. It’s too late!” she declared. 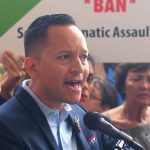 Stewart and Smith were joined by Democratic state Sen. Victor Torres, representatives of the Florida Coalition to Prevent Gun Violence — which is led by the League of Women Voters of Florida — and survivors and family members of the victims of the Pulse shooting, which left 49 dead and 53 wounded. They gathered in front of the Orange County Courthouse to demand the Florida Legislature at least hold hearings and votes on SB 176 and HB 291, as well as provide public debate on both sides and records of where Florida lawmakers stand. The bills also call for comprehensive universal background checks on gun purchases. “It’s time for bold, unapologetic action,” Smith said. Smith said he, Stewart and the coalition had been planning this press conference for weeks, and decided to go forward after the Las Vegas shooting. “Some might think it’s insensitive for us to have this press conference today. It would be more insensitive not to move forward with this legislation,” Smith said. The coalition, formed days after the Pulse massacre, includes more than 100 groups of varied interests ranging from the Association of Florida Colleges, Doctors for America, Equality Florida, dozens of churches and temples, the Newtown [Conn.] Action Alliance, and a dozen city mayors and other local officials.